Laetiporus sulphureus – or as Miss E L Stephens will have it Polyporus sulphureus – is a species of bracket fungus found growing on Pine or Oak trees in the forests on the slopes of Table Mountain in late Summer usually after some rain. Its common names are sulphur polypore, sulphur shelf, and chicken of the woods – named thus for it’s texture when cooked. Miss Stephens was a friend of my parents and I remember going to visit her in her little cottage in Cape Town’s Southern Suburbs, usually on a late Sunday afternoon, when people would come by with their baskets of mushrooms picked on a walk in the woods for her to identify them as edible or not. 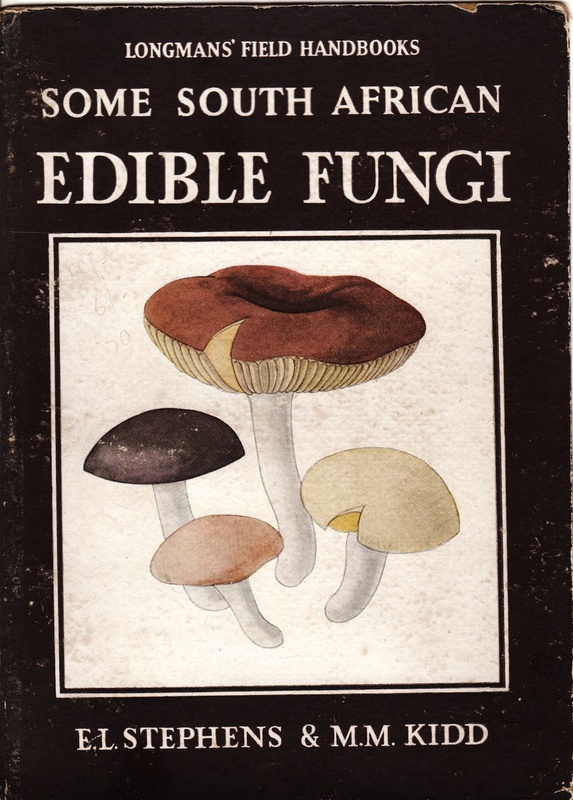 In her book, Some South African Edible Fungi, illustrated by well known botanical artist, Mary Maytham Kidd, there was a Poisonous Fungi version too, she talks of the many mushroom types available in the Cape, including Morels. And she says, “Fish Hoek township covers what was the best Morel site near Cape Town.” Wonder how many Morels pop up in Fish Hoek gardens now and are destroyed as being poisonous? Of this fungus she says that inside the tree “its threads spread rapidly through the heart wood. This will cause the tree to die and its wood split up into many red-brown cubical pieces, hence the forester’s name of brown-cube rot.” The trees become inflexible and can’t sway in the wind, so topple over. So often in fallen oak trees, the insides are hollow. 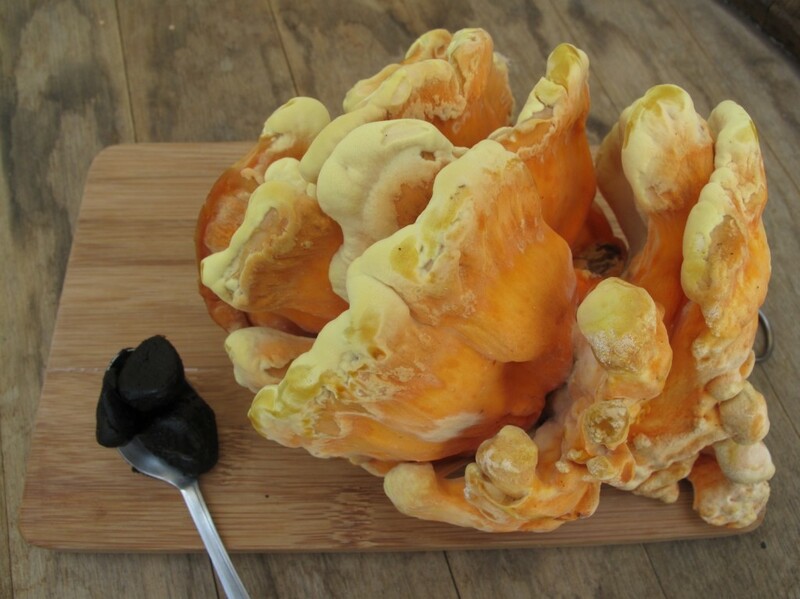 Our friends Paddy and Sophia Lindop brought us this beautiful chicken-of-the-woods and we made a risotto with it, using Black Garlic which has recently become available in our supermarkets and delis. 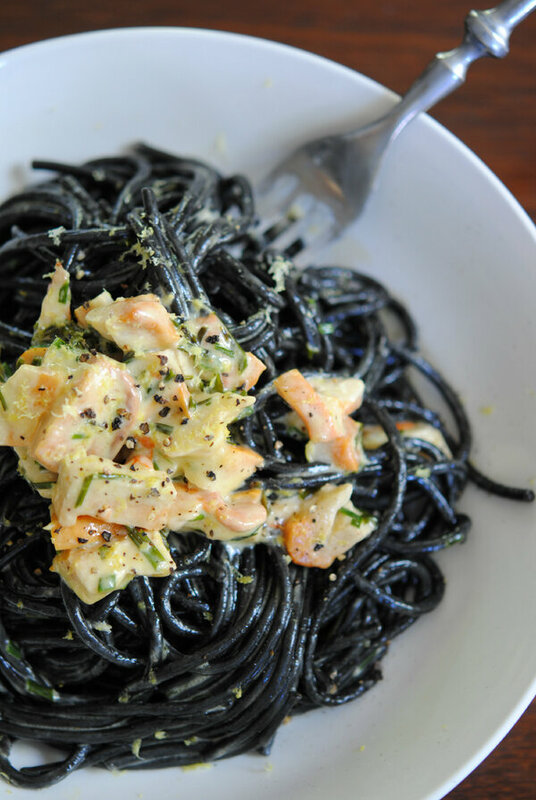 Sophia made Squid Ink Pasta with a chicken-of-the-woods sauce. Heat the olive oil in a large, wide, deep pan. Add the onion, carrot and celery and cook until the onions starts turning golden. Add the rice and continue to stir 1 further minute. Pour in the wine and add the garlic. Allow the wine to almost boil away. Ladle a little stock into the pan and stir well with a wooden spoon. As it is absorbed, add the hot stock a ladleful at a time, stirring continuously. When you have added half the stock, add the mushrooms and the tarragon. When all the stock is absorbed, after about 15-20 minutes, test the rice; it should have a creamy consistency. If it has a chalky thread through each grain, you will need to cook it further in a little more liquid. You can use hot water if you have no stock left. When done, taste for seasoning and add sea salt and freshly ground black pepper an stir in the cream. Put a lid on the pan and allow to stand for about ten minutes. Serve sprinkled with the cheese.